Leslie Basham: As a mom with her hands full, Janet Pope learned how to memorize books of the Bible without adding an item to her to-do list. Leslie: This is Revive Our Hearts with Nancy Leigh DeMoss for Monday, January 5, 2015. Nancy Leigh DeMoss: Today we’re going to hear from a guest who says that she has an alternative for the frazzled, guilt-ridden woman who longs to know God and His Word but hasn’t yet found a way to accomplish this amidst the unrelenting treadmill of activities. You may relate to that. I know you’re going to be excited to hear from our guest today, Janet Pope, who is the author of a book called His Word in My Heart. The subtitle for the book is Memorizing Scripture for a Closer Walk with God. Janet, thank you so much for joining us here on Revive Our Hearts today. Janet: I’m so thrilled to be a part of it. Thank you for inviting me. Nancy: We're actually not in our normal setting where we record Revive Our Hearts, but we're at the studio of our station partner KBTT here in Dallas, where you live. I'm here for some meetings. Your schedule was open and mine was as well, so we've had a chance to get acquainted. I know our listeners are going to be encouraged by what you have to share with us. Anyone who’s been listening to Revive Our Hearts for any length of time knows that we are just trying to get women into the Word of God. We believe that's where life is. We don't live by "bread alone but by every word that comes from the mouth of God." I realize that you’re a kindred spirit. You’re a student of God’s Word. You’ve been a Precept teacher, and a number of years ago, you kind of stumbled onto a practice that has made a radical difference in your life. That became the subject of this book, His Word in My Heart. You’re a wife. You’re a mom of two kids. I know it’s influenced you in those areas as well, but take us back to where you were those years ago. You were in the process of a move. Describe for us kind of what your life was like at that point. What was the setting, the backdrop, for how you got into this matter of Scripture memorization? Janet: I’d love to tell you about it. It began in 1991. We moved from living in Dallas, Texas. We’d been there for eight years, and we were moving to Hattiesburg, Mississippi. Nancy: Quite a difference there! Janet: Yes. My husband grew up in Mississippi, so for him, we were moving home. But for me, I was going to a totally foreign place where I didn’t have any friends, and the first few months were very, very lonely for me. I just cried out to God, hoping that He would bring about a change in my life. Well, at about that time, some of my new friends invited me to go to a Christian conference in Chattanooga. It’s about a six-hour drive, and I thought, If nothing else, I need a break from the "mom routine." Nancy: How old were your children at that time? Janet: They were four and seven. Nancy: You had your hands full. Janet: One was in school and one was still at home. So anyway, one morning of the conference, a woman from the audience was called up to the front spontaneously and asked if she would share some Scripture with the group. She then quoted the entire book of Colossians for all of us. I just sat there dumbfounded. I was mesmerized by what I’d heard, and I thought in my own heart, I wonder what it would be like to really know God’s Word, to have it so imbedded in my heart and mind that I would carry it with me wherever I would go. I had been a Christian for fourteen years. I was thirty-five years old. I had not grown up in church, but I considered myself a very sincere and dedicated Christian. I read my Bible every day, but I saw at that moment how shallow I really was. I really didn’t know God’s Word. I wasn’t a serious student of the Word, so on the six-hour drive home, I cried out to God and asked Him to make a change in my life. I thought, Okay, two small kids, I have no extra time slots in my day. But I reasoned in my mind that if God wanted me to get to know His Word, then He would make a way—that He wouldn’t ask something of me and then make it impossible to achieve. Because this woman had recited the whole book of Colossians, I thought, Okay, maybe I could memorize Scripture. So I thought, With God’s help, I’m going to start on Ephesians. It took me months and months—probably about six months—but I worked on it every single minute of every day and night. I found that even though I had no extra time slots in my day, I could memorize while I was doing other things. So I included Scripture memory in my morning routine—getting in the shower, blow-drying my hair, putting on makeup and clothes. Those were times when my hands were busy but my mind was free. So I was able to memorize Scripture while I was doing the household chores—vacuuming, folding laundry, emptying the dishwasher, making school lunches, making coffee, things like that—I could memorize at the same time. Not only was I getting to know God’s Word, but I was redeeming the time, just a minute here and a minute there. That’s really where I began. Nancy: How did you pick the book of Ephesians? Janet: Well, it had always been my favorite book, and I’d heard people say that if you had nothing but the book of Ephesians, you could live the Christian life. I don’t know where I got that, but that’s where I started. Now I really don’t recommend starting with the book of Ephesians, because I would recommend a person start with something smaller. But I really was driven at the time, so it worked out for me. Nancy: When you started out, did you think, I don’t know if I can do this? Did it seem really daunting at the beginning? Janet: It did, but I thought, Okay, it is possible, and really, I’m only going to do one verse at a time. I think I was just compelled and driven at that time, and I felt that sense of shame that I really had not given God’s Word the time it needed. The more I got into it, the more I thought, Okay, well, I can do another verse. I can do another one. I can do another one. Nancy: Eating an elephant one bite at a time? Nancy: How did you go about doing this? Did anyone teach you how or give you some pointers? Janet: No, I didn’t really have a method, but I thought, I’ll make my own method. So here’s what I came up with, and of course I would suggest that people take what I’ve done and adapt it to your life. I got those 3x5 cards that are connected with a spiral—not the ones that are scattered everywhere around your house, but they’re all connected. So I wrote out the first chapter. Janet: Yes, by hand. I wrote it out and then just started one verse at a time. My method became memorizing one verse every day. I know that sounds overwhelming, like how could you do a verse a day? But by doing a verse a day, it forces you to come back like twenty-five times during the day. If you just did one verse a week, that doesn’t force you to meditate on God’s Word throughout the day. So by pushing myself to do a verse a day, I had to think about it in the morning when I was doing my chores and then at lunch time and then in the afternoon and then when I was cooking dinner and then at nighttime. This little 3x5 spiral sits right up on my counter. I take it everywhere with me, including ironing and vacuuming. I put it in my car with me everywhere I went, and that became my method. Nancy: Were you saying the verse out loud? Nancy: Well, that’s probably a way you were getting Scripture into them, too. Janet: Oh, it was huge! Without requiring them to learn Scripture, I just was speaking Scripture throughout the day. Nancy: They were learning it. So you started with Ephesians chapter 1, verse 1. Janet: Then the next day I did verse 2 and the next day verse 3, and then after I finished the chapter (most chapters, I don’t know why, are twenty or twenty-one verses) I’d just review for about a week or ten days till I felt like I had it solidified, and then I’d go on to the next chapter. Anyway, I shared it with the girls that I had gone to the conference with, and they said, “You need to recite it for our Sunday school class.” That was huge for me, because I couldn’t even imagine doing that, but I did. So I sort of became the Scripture memory person. Then I went on to another book and another book, and I really didn’t realize that I would get as far as I did, but just one verse at a time, one chapter at a time. Nancy: Have you ever had somebody memorize with you so you have any accountability, or have you pretty much done this on your own? Janet: Actually, I’ve done that with other women when they say, “I really need this.” I say, “I’ll tell you what. I’m on a break right now. Why don’t we do something together?” So I have had partners in that way to get someone else started. I think the best way is to start with something really, really small. For example, I would say, start with Psalm 1. It’s six verses, and it’s so motivational because it talks about the man who is blessed because he is planted by streams of water. He’s meditating on God’s Word day and night, and what’s so great is that Psalm 1 only takes one minute to review. When you’re very first memorizing Scripture, you haven’t found a five-minute block during your day, but you’re thinking, Okay, but I’ve got one minute. So you find several one-minute pockets throughout your day when you’re doing something. Your hands are busy, and your mind is free. So I would say, start with Psalm 1. If you already have Psalm 1, then do like another short psalm, like Psalm 121. Nancy: Can you say Psalm 1 for us? Nancy: Six verses; one minute. Janet: Less than one minute! You just find those little pockets throughout your day when you’re doing something else—when you’re driving, when you’re waiting at the orthodontist. Think about how many times we have to wait. We’re waiting at the drive-through at the bank. We’re waiting at the drive-through at McDonalds. We’re waiting at soccer practice. We’re waiting and waiting, and we have those little one-minute periods of time where we can work on Scripture memory at the same time we’re doing something else. Most of us do our hair the same way every single day, so do you really have to be thinking? Just work on Scripture memory at the same time. You’re putting on your makeup the same way every day. You’re making toast. You’re making coffee. Incorporate it with something else you’re already doing. Nancy: The psalm you just quoted, Psalm 1, describes some of the benefits of getting Scripture into our minds and hearts. Walk us through that psalm and help us think through, what are some of the benefits of getting the Word into our mind? This is the person that God says is blessed, so I just love that. I want to be the person that God says is blessed, not what someone else’s opinion is. God says that the person who meditates on God’s Word day and night is like a tree planted by streams of water. I like to tell this story from my own experience. When I was growing up in central Florida, we lived on a lake, and we had this tree in the backyard. This cyprus tree lived right at the water’s edge, so we would go down there and just sit. It was so peaceful, watching the waves splash up against the tree. This tree, although it was under the scorching Florida sun, was never parched, because the water was its life source. Now, in the front yard, we had one of those massive oak trees that was covered with that thick Spanish moss they have in Florida. And every year this tree lost branches that just died and fell off because the moss was taking over. So for me, these are two vivid pictures of contrasting lives—one that’s thriving, and one that’s withering. So we ask ourselves, which tree do we want to be like? We want to be like the tree that’s thriving, and God said that His Word is water to our souls. So by meditating on God’s Word day and night, we are like the tree that has fruit in season, when God’s time is right. When your mind and heart delight in God’s Word, then your actions will be God-centered and divinely prosperous, and you won’t be withered. This is what I have seen: Mothers are frazzled, and I know because I’m a mother. Mothering is frazzling. But what happens is, our souls begin to wither because we’re dry spiritually. We haven’t had the time that we need in the Word. And honestly, I don’t have time even now, as an empty-nester. I don’t have time to study my Bible every day; or maybe I should say, I don’t study my Bible every day. But because of memorizing Scripture, it’s a very rare day when I don’t spend time in God’s Word. If memorizing Scripture can help us through the day, then we don’t have to be guilt-ridden that we didn’t spend time in God’s Word, because we have been spending time in God’s Word throughout an entire day, just communing with God. Nancy: And let me say, it’s not just motherhood that is frazzling. It’s living that is frazzling. Nancy: We have constant pulls and pushes and demands on us. I’ve been having, over the last couple of weeks, some technological issues and have found myself over and over again frazzled with what that has done in light of my schedule. But you’re right, when our hearts and minds are rooted and grounded in the Word of God, there’s a source of life that you can’t explain. It’s His life. Janet: There’s no guilt. When we don’t spend time in God’s Word, we are guilt-ridden because we’re not doing what we know we should. We know God wants us to spend time getting to know Him in His Word, and when we don’t do that, we are loaded down with guilt. Who wants to live with guilt? I know I didn’t, but I had a lot of guilt. In my own mind, I was tempted to put off my spiritual growth until I had more time. Well, you’ll never have more time; and if you put off your spiritual growth, then where will you get the wisdom you need to raise up a godly heritage, to be the woman of God you want to be and that God wants you to be? Nancy: Take us back to those early days when you were memorizing the book of Ephesians, and draw for us a picture of the before and after—the woman you were before you went to that conference and heard the woman quote Colossians, and the woman that you were months later after you had memorized the book of Ephesians. What difference did it make? Janet: Well, I would like to say that I considered myself a very sincere and dedicated Christian. I mean, I had spent ten years on the staff of Campus Crusade. Ever since I became a Christian at the age of twenty-one, I was a sincere Christian. I read my Bible every day, so to me, I didn’t even realize how shallow I was until that day I heard someone who truly knew God’s Word. That’s when it pierced my heart, and in my soul I was saying, Oh, I’m so shallow. I don’t know God’s Word! I thought, Okay, with God’s help, I’m going to make a change. From that time—that was 1992—God’s Word has become everything in my life. That is my communion with God. Each day as I spend time in God’s Word . . . and even those first few months in Ephesians, I couldn’t get enough. I was finding the oasis for my soul, and I was compelled. I was loving every aspect of getting to know God’s Word. I’d read Ephesians dozens of times—every year, probably, as I read through the Bible in a year. But now I was seeing things that I’d never seen before, because every little phrase, I would go over that, over and over and over in my mind, dozens of times throughout the day. Really, the greatest benefit was that my relationship with God went deeper and broader. I was seeing things about God that I’d never seen before. I found that in the past I had a picture of God that was very small and very controllable, and now God was pushing those boundaries out. I was seeing new things and expanding my picture of who God is and also of who I was. I started to see my own depravity and my own neediness. I saw how needy I was. Nancy: And His grace to meet that need. Janet: Of course, then my passion became Scripture memory, because I thought, This has changed my life! And per se, Scripture memorization is not really a commandment. The commandment is to know God and to know His Word. But He also says things like, we are to have God’s Word ready on our lips. We are to store it up. So for me, I had memorized a verse here and a verse there, but now I was really seeing verses that maybe I never would have chosen to memorize. God was saying, “Yes, you pick all the verses that have something to do with yourself and what you’re going to get from Me; now I’m going to show you some things through the whole context of where those verses are, and also show you some things about Me that you wouldn’t choose to otherwise memorize.” So that has been one of the benefits of memorizing an entire passage as opposed to just a verse here and a verse there. Nancy: We’re going to pick up this conversation and talk more about some of the “how to’s,” and how to not only memorize it but keep it in your heart, and some of the benefits that have come to your life. I know our listeners will want to join us on the next Revive Our Hearts. You’ve shared here about the impact of the book of Ephesians in your life, and I think the first chapter of Ephesians is one of the most powerful chapters for any believer in all of God’s Word. Can I ask you just to quote that chapter for us? Ephesians chapter 1. Paul, an apostle of Christ Jesus by the will of God, to the saints in Ephesus, the faithful in Christ Jesus: Grace and peace to you from God our Father and the Lord Jesus Christ, who has blessed us in the heavenly realms with every spiritual blessing in Christ. In him we have redemption through his blood, the forgiveness of sins, in accordance with the riches of God’s grace that he lavished on us with all wisdom and understanding. And he made known to us the mystery of his will according to his good pleasure, which he purposed in Christ, to be put into effect when the times will have reached their fulfillment—to bring all things in heaven and on earth together under one head, even Christ. In him we were also chosen, having been predestined according to the plan of him who works out everything in conformity with the purpose of his will, in order that we, who were the first to hope in Christ, might be for the praise of his glory. And you also were included in Christ when you heard the word of truth, the gospel of your salvation. In him you were also chosen having been predestined according to the plan of him who marks out everything in conformity with the purpose of his will. And we who were the first to hope in Christ might be for the praise of his glory. And you also were included in Christ when you heard the word of truth, the gospel of your salvation. Having believed, you were marked by him with a seal, the promised Holy Spirit, who is a deposit guaranteeing our inheritance until the redemption of those who are God's possession, to the praise of his glory. Nancy: That’s Janet Pope, quoting Ephesians chapter 1. What a rich, rich storehouse! What a treasure that is in her heart, but now as she has also shared it with us—you can’t see her, but we’re in a studio here, and she doesn’t have any notes or a Bible in front of her. This is a passage that she has hidden in her heart. She didn’t know I was going to ask her to quote Ephesians 1. I didn’t know I was going to ask her to quote Ephesians chapter 1, but it’s there in her heart. Now it’s ministered to us as well. 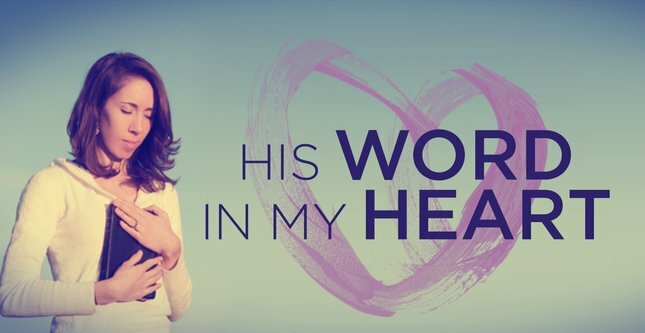 Her book is called His Word in My Heart. Join us on the next Revive Our Hearts as we talk about how you can get His Word in your heart—how to get started, how to keep going, and how it will transform your life. Leslie: That’s Nancy Leigh DeMoss, talking with our guest Janet Pope. They’ve been encouraging you—you can memorize Scripture! This is the perfect time to start or to start again! Nancy doesn’t just suggest that we memorize Scripture. She’s doing it too. Last year, attendees at True Woman '14 got a treat as Nancy launched into a major recitation. Nancy: For me, one of the highlights of 2014 was taking on a big project of memorizing 200 Scripture verse about Jesus from the Old and New Testaments. For about six months during the year it felt like I was always memorizing, whether I was taking a walk, or standing in line, in my car, waking up in the middle of the night—everywhere, any time, I was focused on meditating on those Scriptures and committing them to memory. Hard as it was to get all those Scriptures memorized, it was such a blessing in my life. As I focused on those Scriptures about Jesus, I got to know Him more. And it was a great joy to recite all those verses at True Woman '14 this past October. This could be the year you make Scripture memory a bigger part of your life. I’m encouraging you to start memorizing some verses about Jesus. You don't have to start with 200 of them, you can start with just one at a time. To help you, we want to send you the Scripture memory pack. It’s a set of fifteen cards. On those cards you’ll find verses about Jesus that we're encouraging you to commit to memory this year. We’ll send you the Scripture memory cards along with the DVD of the recitation I gave at True Woman '14. It's called, "Jesus, What a Wonderful Name!" These Scripture memory cards will be a valuable tool to help you memorize. And the DVD will encourage you to focus on the wonder of our Savior. We’ll send the DVD and the memory pack when you support Revive Our Hearts with a gift of any amount. Ask for them when you call 1–800–569–5959, or visit ReviveOurHearts.com. And thank you to all who supported the ministry last month to help meet year-end needs. Our team is still sorting through the last minute donations, but in the next few weeks, we’ll let you know whether the goal was met. But regardless of where we ended up, and want you to know how thankful we are for every single gift—no matter how large or small. Would you pray in the year ahead that the Lord would help us to be good stewards of those resources and to have a fruitful year of ministry as together we help women thrive in Christ. Leslie: Janet Pope has memorized fourteen books of the Bible along with over 100 other chapters, yet she says she doesn’t have a great memory. Janet: When it came to help with homework, honestly, I could never remember any history, English, or math—anything. So why have I been so successful at memorizing Scripture? It's because I have a higher goal than just to memorize the Bible. That's not my goal. My goal is to know God and to walk closely with Him. Leslie: She’ll provide hope to anyone who struggles to memorize, tomorrow on Revive Our Hearts.